If you'd like to take on a bit of a project, have I got the deal for you! Marlboro Motor Raceway in Maryland is currently up for sale on Craigslist of all places for a cool $9,985,000. Once known as "The Grand Lady of the East," this track hosted everything from NASCAR to the Corvette's racing debut. The only catch is that the facilities are crumbling, flooding from a branch of the Patuxent River has buried and washed out portions of the track, and nearby residents would almost certainly raise a stink at the idea of reopening it for racing, but you could keep the dream alive! A website exists for events there, but given its current condition, I don't think those events ever panned out. 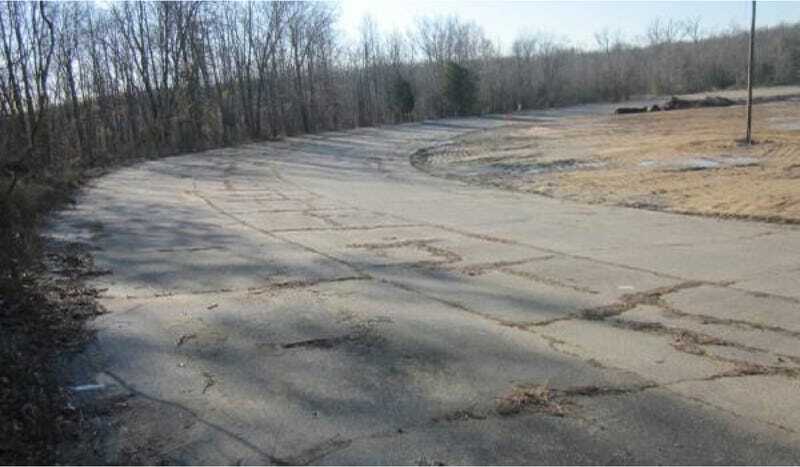 Marlboro Motor Raceway was last used in 1969, when safety concerns about close opposing straights forced most of its events to relocate to nearby Summit Point, You can see how close the two straights are in this video. Unfortunately, the straights border a protected wetland area, preventing any move to correct the issue. MMR's compact road course layout was the reason for its downfall. Of course, you could also try to restore the 1/3-mile oval that doesn't have those design issues. MMR started its life as a dirt oval in 1952. It was paved when it was integrated into the design of the road course in 1954. Unfortunately, low attendance doomed the oval part of the track, with most oval races off the schedule by 1964. If you're paying for anything, you're paying for the circuit's rich history. In its heyday, this was one of the major race tracks in America. The Washington, D.C., area affiliate of the SCCA known as the Lavender Hill Mob played a major part in the road course's construction to allow the club to have a dedicated place to race, as they had been limited to temporary circuits before MMR was there. NASCAR, the SCCA and even the FIA held events at MMR, including a 12-hour FIA enduro. Roger Penske got his start here. Chevrolet felt the track was so important that they named a special shade of red for the Corvette after this track: Marlboro Maroon Metallic. Unfortunately, the Craigslist ad's touting of the site's "22 acres of commercial and 20 acres of residential zonings" doesn't bode well for MMR's continued existence. The crack-pipe price just below $10 million doesn't seem to help, either, as Wikipedia lists an earlier price of $3.5 million. Of course, because this is Craigslist, the condition listed is "good," even though I don't see a single thing besides a parked RV that might actually fit that condition. Will you be the one to save this piece of motorsports history? All images belong to the "For Sale" listing on Craigslist.